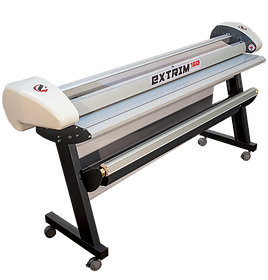 EXTRIM is a electrical rotary trimming machine that is capable of cutting flexible materials up to 1.8mm in thickness with great precision and ease. Equipped with self sharping circular blades, the Extrim allows you to cut rolls or sheet goods without hesitation. This blade is mounted on a sturdy precision carriage assembly mounted on a linear recirculating ball guide ensuring maximum precision and long-lasting performace. The Automatic lowering pressure bar holds the marterial in place during the trimming function, along with the variable speed control enabling the user to select speeds from 0 to 100m/min. The constant LED illuminated system helps the user to track and see their alignment without difficulty.